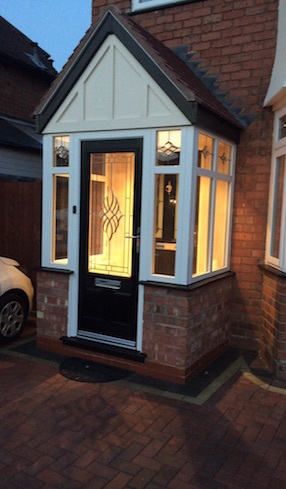 A new UPVC porch is a fantastic way to give the entrance to your home the kerb appeal it is craving. Not only do they add an extra layer to your home that looks great but the additional space is practical and even utility bill reducing. The extra space is ideal for taking off wet clothing, dirty shoes or wiping down pets before entering your home ensuring the mess stays outside. The additional room could also be used to store clothing garments or hide unsightly gas / electricity metres. Depending on personal choice, you can have a composite door, upvc panelled door, sliding patio door or even UPVC French doors as your new entrance. All these options are manufactured by Birmingham Glass Services at our West Heath based factory with our premium 5 point locking mechanism and anti snap barrel. With the increase of burglary and car theft let us help give you peace of mind and improve your security. 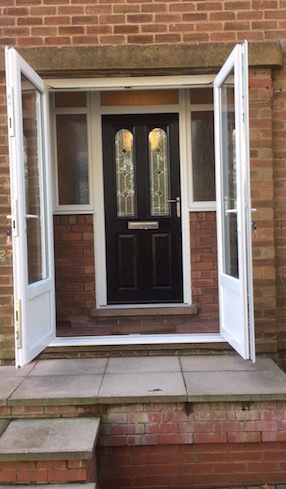 If designed correctly, your new UPVC porch should allow you to step inside and close the door behind you before opening your existing front door. This will prevent warm air escaping outside, keeping your homes temperature more consistent thus keeping your utility bill costs down. If saving money isn’t enough of an incentive, its improved energy efficiency is greener for the environment.